The new range of Crewsaver USCG-Approved lifejackets is the first series of its kind to provide a complete, safe, stylish, comfortable and affordable inflatable solution to the everyday recreational boater. By applying the knowledge gained during the development of the ErgoFit lifejacket range, alongside 30 years of experience in the design and manufacture of world-leading inflatable lifejackets, you are assured that each Crewsaver lifejacket encompasses the most advanced and essential safety features at every price point. The Crewfit 35 Sport incorporates the latest Fusion 3D technology, ensuring maximum comfort levels. 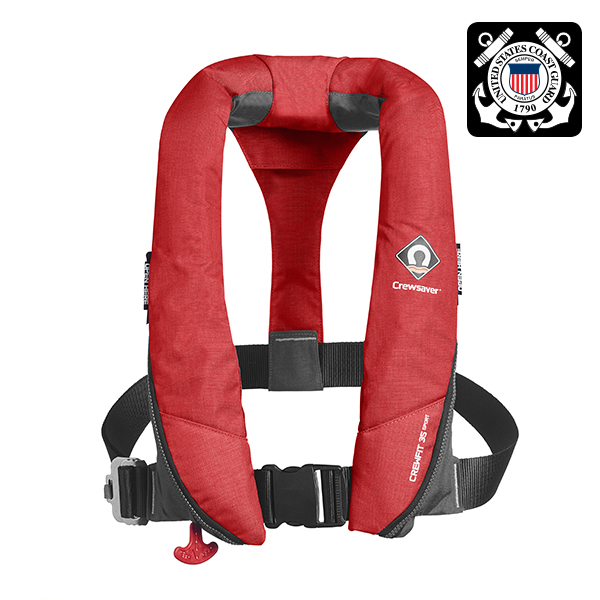 As the entry level to the Fusion 3D segment of the USCG-Approved range, the Crewfit 35 Sport includes essential features that ensure the recreational user remains safe when out on the water. Fundamental to all Crewfit models is the unique chin support which helps keep your airway clear of the water in all conditions. Most property loss occurs in the initial minutes of a break-in, before police or security teams have had a chance to respond. The GOST Cloak system is designed to provide protection in the critical time gap between the alarm’s activation and the response team’s arrival at the scene. In a matter of seconds, the GOST Cloak fills the protected area with an impenetrable cloud of smoke that prevents the loss of property, confuses the thief, and forces the intruder out of the premises until the response team arrives. The fog is created by vaporizing a specially formulated glycol solution. Glycol is classified as a foodstuff and is found in many day-to-day substances such as toothpaste and deodorants. The vapor produced is a dense, white fog which reduces visibility to less than 30 cm, practically nil visibility, but which, under normal usage, is harmless to anything found aboard the yacht or commercial ship. The Icom IP100H radio system is a great way to deploy communications on a ship or in a shipyard. Icom’s IP100H WLAN or IP radio is a compact, yet powerful device.Measuring only 95 mm high (~3.7 inches) and weighing 205 grams (~7.2 ounces), the IP100H is one of the smallest professional radios on the market. The IP100H is a wireless network radio and can move freely within the network. Adding several access points can easily expand coverage for your radio system. The IP1000C controller that connects to the wireless network allows grouped users to hear and talk with another group. Individual calls are also possible. Full duplex communication (as with a regular telephone) can be used if enabled in the IP1000C controller and if a headset is connected to the IP100H. Icom's new radio system for wireless networks is a product that bridges the gap between license-free and licensed radio devices. The system is easy to connect to an existing wireless network and allows full duplex communication with reliable sound quality. Icom’s new WLAN-based radio system offers scalable, license-free communication that uses standardized wireless network products as infrastructure. In several cases, said infrastructure is already in place. License-free system: No radio licenses are necessary for the system as it uses standard WLAN networking products as infrastructure. The system uses the IEEE 802.11 a/b/g/n standard. Scalable system: Communications are distributed across WLAN access points in an IP network which makes it easy to expand the system. Secure encrypted communication: The wireless security protocols WPA-PSK and WPA-PSK2 encrypt the calls. Simultaneous use: Many users in the system can transmit simultaneously. When a headset is connected to the IP100H, users can talk concurrently in full duplex – similar to talking on a regular telephone. Localization of users: IP100FS software can connect to the network and be used as a fixed radio. It can call a user, send a message and can easily see which access point each user is connected to. Easy maintenance: Most programming takes place wirelessly over the network eliminating the need to gather all radios every time a change is made. Reliable sound quality: Since communication over a WLAN offers a wider frequency bandwidth and QoS priority packet delivery, the sound quality is higher than in a traditional radio communication system and is comparable to regular telephone communication.